I love horror movies. Some of my first memories regarding movies are watching A Nightmare on Elm St or Poltergeist. As I got older, my interest in Horror increased. I love to challenge a movie to make me scream or frighten me. So, when I saw a new Horror movie was coming out this month, I had to go! 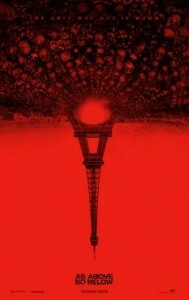 “As Above, So Below” is one of those found footage films that for some reason, keep getting made. At first the concept was creative and new. Today, it seems overplayed and unoriginal. Somehow, the concept has been ran to the ground. I’m usually not a fan of this format, but the idea of caves and scary things showing up inside of them excited me. There’s something scary about being underground in a monstrous maze of caves and darkness. The premise is simple. A treasure hunter is looking for the infamous Philosophers Stone (you might recognize this from the first Harry Potter book/movie. Trust me, I thought of many Potter references in this flick.) She discovers that the stone might be underneath the catacombs of Paris. I won’t give anything else away, but the deeper they go into the caves, the more things start happening. From past memories coming to haunt them, and people watching them. All of this taking place in darkness and tight corners. – The idea of being stuck underground, with no escape was kind of suspenseful. There were a few moments that I was on the edge of my seat, wondering what would happen. It had a ton of complete abandonment; cut off from the outside world completely. -This film, for a found footage, was shot very well. The caves looked cool, and every time they went into a new room of the catacombs it always looked different that the others. It had some really good camera shots, especially for being filmed in caves! – The characters were just thrown at you. Not too much build up, but what do you expect out of movies like this? – The beginning is kind of slow. It takes time to really get interesting. Once the middle of the film begins, it gets interesting and intense. Alas, towards the end it falls apart into a stupid, boring ending that will make you scratch your head. “As Above So Below” to me is what I just stated. Boring beginning, interesting ending that got me excited to see how it would’ve ended, and a weak ending that MIGHT even make you laugh. And When you laugh at a horror movie, they have failed to scare you. I found myself laughing a lot towards the last 20 minutes of this film. It just got silly. Save your money. If you really want to check it out, wait for Redbox. Next Next post: Top 5 Movies Of The Summer Of 2014!